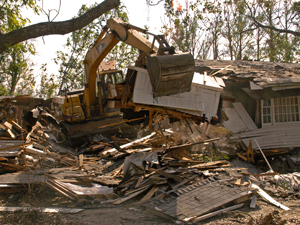 (FinalCall.com) - In the aftermath of Hurricanes Katrina and Rita in the Gulf Coast, the federally-funded Road Home program has drawn criticism due to accusations of discriminating against Blacks in the distribution of recovery funds. In a decision on Sept. 22, the United States Court of Appeals for the District of Columbia issued an injunction to place a freeze on the remaining $148 million in Louisiana's Road Home Program. This was the result of a lawsuit filed two years ago and will reportedly give the plaintiffs an opportunity to present proof that the state and the Dept. Housing and Urban Development (HUD) engaged in discriminatory practices. “Today's ruling keeps open the pathway to justice for thousands of Louisiana homeowners who received grants based upon this discriminatory formula,” said John Payton, NAACP Legal Defense Fund President and Director-Counsel. With an establishing budget of $11 billion in federal dollars, the Road Home program was led by HUD and the Louisiana Recovery Authority to aid residents affected by the two hurricanes. “I would be lying if I said nobody benefitted from the Road Home program because I know some who did. But this legal decision shows that when Blacks were complaining about the red tape it wasn't conspiracy theory—it was actual facts. We have and are being discriminated against. I was tired of fighting,” Ms. Washington told The Final Call. “This (court ruling) is great but it may be too little too late. When you're fighting this system for so many years that wears on you financially, mentally and physically. So can you truly repay us for all of that we have lost? I think not,” she said. The Legal Defense Fund and the Greater New Orleans Fair Housing Action Center led the charge on the lawsuit filed in November 2008 on behalf of five individual plaintiffs representing over 20,000 Black homeowners. The website for the Greater New Orleans Fair Housing Action Center paints a mathematical picture of the alleged discrimination. Consider two identical homes, with identical hurricane damage, and identical repair cost of $150,000. One home is in a predominately White area and worth $150,000 while the second home located in a predominately Black area is worth only $100,000. Under the discriminatory formula, the White homeowner would be eligible to receive $150,000 while the Black homeowner would be eligible to receive only $100,000 - in spite of the fact that the homes are identical. Because of the discriminatory formula, the Black homeowner is $50,000 short of the amount needed to get back into her home. “This fact pattern has played out thousands of times leaving Black homeowners far short of the amount they need to rebuild their homes,” the group says. Mr. Perry's group is hopeful that the ruling represents an opportunity for all homeowners to receive grants based on a non-discriminatory formula. The State of Louisiana was ordered to halt all disbursement or rerouting of Road Home funds until the U.S. Court of Appeals reaches a decision as to whether this injunction will also have any impact on those who previously received grants under the imbalanced formula. “I pray everyone gets what they justly deserve. Five years later it is sad to see us still in this battle from Katrina. The struggle may never end,” said Ms. Washington.